Yeah, I like Billy Idol. Deal with it. I have a slight recollection of purchasing this EP from a thrift store in Eugene, probably in or around 1995. I could be making that up. I do know that I've had this record for a really long time, and I've never even considered getting rid of it. This is a rare pre-debut-LP EP, and it contains only four songs. Only one of them ("Dancing With Myself") would end up on Idol's debut, but even that one is presented here in a "long version." "Mony Mony" starts things off, and it's interesting to note that Idol released this as a single in 1981, though he must have re-released it in 1987 to coincide with the release of Vital Idol, which we will get to. "Mony Mony" was the first single I ever bought with my own money, but when I got the 7" it was the live version, and I was slightly disappointed. Obviously I did not know at the time that he already released it once, so putting it out in a live (or "video," as it were) context actually made sense. Anyway, it's the studio version here, and I've actually grown to favor the live version, as I find the studio recording a bit stiff. "Baby Talk" fills out side one, and it's a bouncy, almost retro-ish number containing the lyric from which this EP takes its name. It has a weird a cappella ending that seems out of place and awkward, but Billy could often make that work. The track is a good transition between his Generation X semi-punk and his new radio-ready rock. "Untouchables" is very new wave, and not your typical Billy Idol, but I bet it sounded pretty badass in '81. It actually sounds quite nice now. Nothing too notable, but a song that would make a great closing-credits-in-an-80's-movie cut. "Dancing With Myself" rounds out these four songs, and like I said, it's the "long version." It's still not very long (not even five minutes), and I think they just add some filler to the middle and end. A classic song that I've probably heard too many times, but it's still fun. 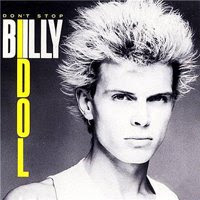 Don't worry: my Billy Idol collection is quite limited.